2018 started with two great victories, the vote of the Members of European Parliament for the ban on electric fishing and the withdrawal of the Notre Dame des Landes airport project, in western France. You will find below an article about the first topic that resulted of an exemplary mobilization, but it is about the second that we want to talk here. This victory was won by the peasants who worked on these lands and by all those who occupied them in order to defend a preserved farmland ecosystem and to invent new ways of living. It is also a victory for the thousands of people who supported their exemplary fight, as they were convinced that the good intentions expressed by the governments during the Climate Conferences are not enough and that a deep questioning of our ways of life is absolutely necessary. Five years ago, we stated in an editorial of this newsletter that the burial of this anachronistic airport would not be a step back, but an opportunity to take the turn of the ecological and social transition as long as there was still time. The ecological transition, which is more and more touched upon in speeches, is still very poorly translated into reality. We therefore welcome both the decision of the French government, its consistency with its positioning re global warming and the courage of the opponents against the airport project who fought for decades on the ZAD Zone à développement différé (Postponed Development Area) renamed Zone à défendre (Area to be defended) and elsewhere, without whom these agricultural lands and this wetland would already have been concreted and irreversibly destroyed. History is not a long calm river. There are rare moments, when the evolution of the balance of power provides opportunities that allow decision-making to break with prevailing trends. New spaces of creation then open up, the range of possibilities widens, but not always for a long enough period for this to result in legal, institutional and political changes. 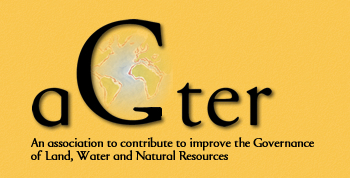 The AGTER project was born from this observation, made by people who had worked on different continents: collecting experiences related to the governance of land and natural resources, collectively analysing their successes or failures and making these reflections available for those who struggle and for decision makers, in order to contribute to the invention of new management methods, legal provisions and democratic forms. As the fight against Notre Dame des Landes airport, the fight against the expansion of Larzac military camp that was victorious 37 years ago was not just a local struggle. The peasants of Larzac, by creating the Société Civile des Terres du Larzac, enabled the management by the inhabitants of the plateau of lands that had been expropriated by the State, combining in a new way the rights of the State, those of the inhabitants of a territory and those of peasants and breeders. By acting outside the law at some point they helped to create new norms, a new law. At the same time, trade unionists and politicians were searching for new ways of managing rural territories that could adapt to new development requirements. In 1977 Edgar Pisani, the Minister of Agriculture who had been one of the architects of the modernization of French agriculture in the 1960s, proposed a project to create Land Offices, that was included in the joint program of the left in 1981, then abandoned by the government of François Mitterrand (see below the coverings of several articles of the documentary fund of AGTER on these subjects). Governance of rural territories is still a relevant topic in France. We are witnessing a gradual but radical rethinking of the modernized peasant agriculture model that made the agricultural development of France after World War II possible. We are moving towards an agriculture model without farmers, which is controlled by the financial world, like in Argentina, Brazil, Russia or Ukraine. We must reverse the trend of spreading ever-larger production units, operating in the form of capitalist enterprises that increasingly mobilize capital from other sectors and whose financial profits often partly come from public subsidies. Paradoxically, the interventions on land operated by the State for the construction of the airport can become an opportunity now, at the end of the fight: they facilitate the experimentation of other ecologically and socially sustainable governance mechanisms, together with all the actors who made the victory possible. Building the future of the territory of Notre Dame des Landes means exploring with them new forms of management of rural territories aiming at conservation and development on human scale of family farms that preserve the general interest starting with production of quality food and job creations. In this newsletter, you will find a series of unpublished articles that discuss the importance of strengthening or creating collective rights management bodies at different levels, but first of all, at local level, in forest ecosystems in Guatemala and Cameroon, with or without indigenous populations. Implementing multi-level governance, run not only by States, with top-down binding global regulations, but also bottom up while recognizing various degrees of territorial autonomy, is a leitmotif of AGTER’s work. Several articles in this newsletter contribute directly to this reflection, especially those of our colleagues in Central America. We also touched on these issues in the land workshop and the 4 / 1000 initiative about soil carbon sequestration that was attended by several AGTER members. You can read a first report about it on the website of the Land Tenure and Development Technical Committee. We draw your attention to the beautiful video "I’ve never been to the ZAD" that we have reviewed below. AGTER joined the call to celebrate the victory on February 10 at Notre Dame des Landes and to support all those who want to write a page of the construction of new management solutions for our rural territories. We also invite you to watch three interviews of Global Land Access Forum attendees (WFAT 2016), which address the issues raised in this newsletter in Mexico, Niger and Cambodia. Retour sur les Offices fonciers, une proposition audacieuse d’Edgar Pisani, il y a 40 ans! Regards croisés sur la gestion communautaire des forêts au Cameroun et au Guatemala, une étude menée par AGTER avec des organisations de petits exploitants forestiers de ces deux pays. Les analyses et les leçons de 3 ans de travail. Organisation communautaire et action collective. Comment créer ou renforcer les capacités pour la gouvernance collective des ressources communes? Comment créer ou renforcer les capacités des habitants pour la gouvernance collective des ressources communes ? Le regard et les réflexions de l’ancien sous-directeur de l’Association des Communautés Forestières du Peten (ACOFOP - Guatemala), après un voyage d’étude dans les forêts du Cameroun organisé par AGTER. Suite au voyage d’études dans les forêts du Cameroun organisé par AGTER auquel il a pris part, l’ancien sous-directeur de l’association de foresterie communautaire du Guatemala (Ut’z Che’) démasque ici l’omnipotence d’un droit de propriété unique et absolu qui nie l’existence de droits multiples. Tant au Guatemala qu’au Cameroun, ce sont les instances de gouvernance locales et territoriales qu’il faut renforcer ou créer si elles n’existent pas. AGTER a été invité à participer à cet atelier en organisant la troisième et dernière table ronde: L’environnement institutionnel et les politiques publiques visant à favoriser la séquestration du carbone sur le long terme et leurs liens avec les questions foncières. Vous trouverez ici l’article publié sur le site du comité technique foncier et développement à ce propos. Instrumentos para sistematizar y escribir las normas que ya existen en los territorios indígenas, tierras comunales y otras categorías de espacios de ocupación o posesión ancestral, independientemente de si el pueblo indígena las ocupa actualmente o no. El caso paradigmático de la tierra comunitaria de Chuarrancho recuperada mediante un fallo judicial. Bases para la gobernanza territorial establecidas por la Comunidad indígena Maya Kaqchikel Chajoma’ de Chiwatutuy. Este documento, uno de los primeros publicados en el fondo documental de AGTER, discute la contribución de los residentes del Larzac a la reflexión nacional sobre la gestión de las tierras agropecuarias. El SCTL tiene un interés que va más allá del contexto local. Esta pequeña región, donde los habitantes manejan las tierras recuperadas después de la lucha contra la expansión del campo militar y alquiladas al Estado, es probablemente la única en Francia que ha visto aumentar el número de sus agricultores y ganaderos durante las últimas tres décadas. Síntesis de la reflexión cruzada sobre la forestería comunitaria en Guatemala y en Camerún que AGTER llevó a cabo con organizaciones de ambos países. This paper, one of the first ones of the AGTER documentary collection, discusses the contribution of Larzac residents to the national reflection on the management of agricultural land. The SCTL has an interest that goes beyond the local context. This small region, where the inhabitants themselves manage the lands recovered after the fight against the expansion of the military camp and rented to the State, is probably the only one in France which has seen the number of its farmers and breeders increase during the last three decades. Harouna Abarchi, responsable du département pastoralisme à l’Association pour la Redynamisation de l’Élevage au Niger nous parle ici de l’accaparement des terres pastorales du Niger pour les besoins de l’industrie nucléaire et revient sur les conséquences sanitaires et environnementales de l’exploitation de l’uranium. Notre Dame des Landes. Défendre ceux qui se battent pour nous. FMAT 2016. Entrevista con Elena Lazos. Privatización de tierras y de recursos naturales en México. Elena Lazos Chavero, profesora en la UNAM (México) nos habla de la privatización de las tierras y de los recursos en México, de la evolución de los ejidos, de las migraciones, de los cambios que se dan en las relaciones familiares y en los pueblos indígenas, del maíz y de los peligros de la introducción de plantas transgénicos. Neth Prak, spokesperson ot the Bunon Indigenous People Asociation (BIPA). Cambodia tells us about the loss of the ancestral territories of the Bunong people, the destruction of indigenous cultures. But it is not only a problem of the natives, it is a problem for the whole of humanity.